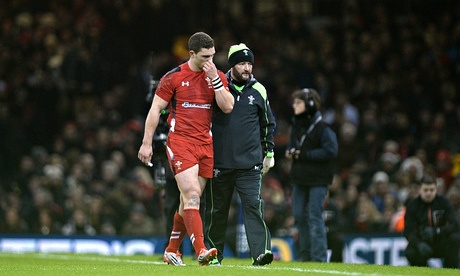 Why did George North stay on the pitch? I have gone on record in a previous blog article (Rugby’s Biggest Challenge) that concussion injuries are the biggest threat to the growth of the game of rugby. Ours is a collision sport and head injuries will happen, but it is how we deal with them that will determine if parents without a background in the game will allow their sons and daughters to participate in rugby. The RFU are spending time and resources through the Headcase campaign in educating players, coaches, referees and parents to recognise signs of concussion and have put in place protocols to make sure players, especially youth players, that have taken a knock to head have a proper amount of rest before being allowed to play again. Anecdotally these precautions have been well received and followed in rugby clubs around the country and in rugby playing schools too, although there have been some worrying stories of schools coaches ignoring protocols to chase a cup win. Thankfully these are rare. But it is at the professional level where these protocols must be strictly adhered to. These games are the showcase of the sport and none more so than the Six Nations which is watched by more people of all ages that any other rugby competition in the UK. What we see happening on our screens on Six Nations weekends is what our youth players will try to emulate on a Sunday morning at their clubs. George North looked as though he lost consciousness after colliding with Mike Brown but somehow he was allowed to finish the game despite having already received a previous blow to the head. North is a very high profile player who many youngsters look up to as a role model, but he and the medical team (and the broadcasters) have to understand that there is far more ay stake than winning a game when they decide to play on in these circumstances. I welcome World Rugby’s intervention to investigate if the correct protocols were followed on Friday night and if they were, then the protocols must be amended. The rugby viewing public and rugby players young and old have to understand how dangerous it is continue playing after a blow to the head; dangerous not just for players but for the future of the game. Frankly that just made a mockery of the “Headcase” protocols clubs have been issued with. If a grassroots club or in the case of your article a school did that they would have been dealt with harshly by the powers that be. But because it was that high profile it will be overlooked. IF World Rugby are serious about this then coaches and or medical staff involved in that decision need to be suspended. Even from the TV coverage you would not have put him back on the pitch. That act alone will probably have an impact on the recruitment of young players in a World Cup year as it will be the focus on the media over the coming week rather than the performances of both of the teams in that game and the 4 others who played the day after. Long before players were viewed as “Assets” there was a very very simple, easily understood rule that ALL clubs complied with. Knock to a head causing concussion or loss of consciousness in any way would result in 3 weeks as a spectator for that player. There was no discussion or debate, it was understood and universally adhered to. As it was so simple, everyone understood it and players would not question it. Now players have become “Assets” it would seem that all of a sudden there is some great debate, some players can, it would appear, recover instantly – funnily enough especially those playing at the highest level or those that have important games to play the following week. A fascinating statistic would be to review how many top class players (Premiership/International) have “rested” for 3 weeks or more following a concussion, I am betting this would be zero or pretty close to zero. Any dissertation students out there want to do the research ??! !